The opposition parties met on Monday to discuss submitting a motion of no confidence against Minister of Economic Affairs Kadri Simson (Center). The decision was made to hand in the motion to the Riigikogu's board still this week. Free Party chairman Artur Talvik confirmed to ERR's radio news on Monday that there will be such a motion. "We're now going to agree on the text, everybody wanted to add something, round it off, add their own nuances to it," Talvik said. Chairman of the parliamentary group of the Estonian Conservative People's Party (EKRE), Martin Helme, specified that the plan is to hand in the motion this week. "Our group has suggestions concerning the text as well. We want to bring the issue back into focus after Christmas and the new year overshadowed it. We need to take this all the way. Our main complaint is that the decisions made clearly smell of corruption," Helme said. Simson found herself accused by daily Postimees last year of having influenced the coalition's policy to the end of directing support payments to the pig farming industry to specific businesses, eventually benefiting her partner, businessman Teet Soorm. Simson categorically rejected the accusations and talked about a campaign against her person. The motion of no confidence against her as minister of economic affairs and infrastructure follows weeks of media coverage during which no substantiated claims were produced. The Reform Party as the largest opposition force has been talking about their trust in Simson having suffered on a broader scale. "At first it seemed as though there were no reason for a motion of no confidence — that a person's work and home lives are to be kept separate," Pevkur said in December. "But now it feels as though there are plenty of reasons." 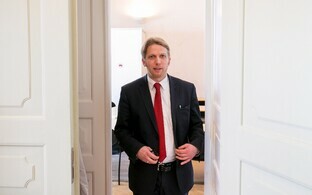 Chairman of Reform's parliamentary group, Jürgen Ligi, said that the issues to be taken up in the motion against Simson ranged "from pig farming to bus transport and investment", saying that "strange choices" had been made by the ministers that couldn't be explained beyond her trying to make gains for her party or her family. Opposition leaders also said on Sunday that they didn't exclude a motion of no confidence against Prime Minister Jüri Ratas (Center).